Show your school spirit when you tailgate with an Officially Licensed NCAA® Tailgating Table! Available in 2'x8 and 2'x4' sizes, these tables are lightweight and fold up to a 2'x2' size. 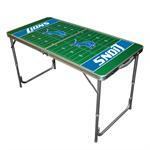 Make your tailgating complete with an Officially Licensed NFL® Team Logo Tailgating Table! Available in 2'x8 and 2'x4' sizes, these tables are lightweight and fold up to a 2'x2' size. All 32 teams available.